> How old is Aboriginal culture? 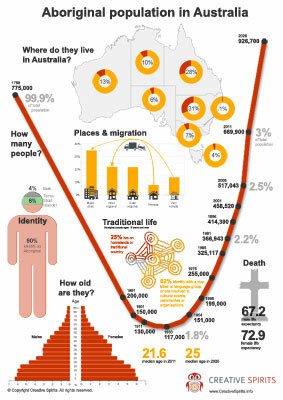 How old is Aboriginal culture? The age of Aboriginal culture changes with new research. Some researchers claim 400,000 years. Aboriginal history is the only history that grows both ways - forward into the present and backwards into the past as new scientific methods indicate that archaeological sites are much older than originally thought. The origin of the Aboriginal people of Australia is not entirely clear. Some studies link Aboriginal people to the first African nomads or to Siberian ancestors . One study determined that Aboriginal people descended from the first people to leave Africa up to 75,000 years ago, reaching Asia at least 24,000 years before other human migrants. Traversing into Australia "must have demanded exceptional survival skills and bravery," said one researcher . Studies published in 2016 confirm a migration out of Africa and place Aboriginal ancestors as the oldest continuous civilisation on Earth . The extensive study of Aboriginal people's DNA dates their origins to more than 50,000 years ago and shows that their ancestors were probably the first humans to journey across Asia and cross an ocean. The findings also show that these Aboriginal ancestors remained almost entirely isolated until around 4,000 years ago. Another study found that a primitive group of humans descended from the Neanderthals and migrated from Siberia to tropical parts of Asia . They contributed DNA to Aboriginal people in Australia along with present-day New Guineans and an Aboriginal tribe of the Philippines. This mixing of genes was reported to have happened 44,000 years ago, before Australia separated from Papua New Guinea. As scientific methods evolve they place the origin of the Homo Sapiens in Australia--not Africa. Research by other scientists supports the theory that Australia's Aboriginal people did not descend from ancestors in Africa or Siberia, but Australia. Were Aboriginal people the first inhabitants of Australia? Discussions about the age of Aboriginal culture often debate whether there have been people in Australia prior to Aboriginal people. Historically there has been "a small number of claims that there were people in Australia before Australian Aborigines, but these claims have all been refuted and are no longer widely debated. The overwhelming weight of evidence supports the idea that Aboriginal people were the first Australians. The following table shows the estimated age of archaeological sites in Australia . Trying to solve it: How old is Australian Aboriginal culture? And Australia's history we have today would not make sense anymore. Our survival in this landscape would lead us to nowhere. Our heritage in writing would only reflect our woes. Australians would not know about these footprints from 'before'. Poem by Zelda Quakawoot . Read more Aboriginal poetry. How to name Aboriginal people? Crosswords: Test your history knowledge!